Every morning, almost half of the United States wakes up and eats breakfast. Touted as the most important meal of the day, 44 percent of Americans choose to have breakfast on a daily basis, according to the USDA. In a perfect world, those people would all wake up to the feeling of sunlight and the sound of birds chirping. Then, they’d go make eggs, bacon and pancakes for the whole family and read the morning paper. However, we all know that mornings rarely go down that way, and when this is the case, eating a quick bowl of cereal is often the breakfast of choice. In fact, at least once a week, 73 percent of children eat some type of sweetened cereal for breakfast, the USDA reports. 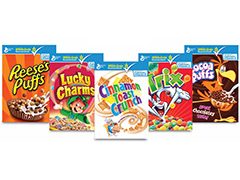 When so many parents are feeding their kids cereals, it’s no surprise that some of the parents have started scrutinizing the contents of those colorful cardboard boxes. Many are concerned with the large amounts of sugar. Others are worried that they contain ingredients that are genetically modified. Despite the claims that GMOs are safe for consumption, parents are worried about the potential long-term effects. That’s why collective interest was peaked when one of the biggest cereal producers, General Mills, announced they removed GMO ingredients from the recipe for original Cheerios. The main ingredient in Cheerios is whole grain oats, and those aren’t available in a genetically modified form. What has changed is that Cheerios no longer uses genetically modified corn starch and cane sugar. This begs the question: Will General Mills make more cereals GMO-free? It doesn’t look like it right now. “For our other cereals, the widespread use of GM seed in crops such as corn, soy, or beet sugar would make reliably moving to non-GM ingredients difficult, if not impossible,” the official Cheerios Website states. The Website goes on to explain that nearly half of U.S. cropland grows genetically modified crops, and that 70 to 80 percent of foods in the grocery store contain GMOs. While more difficult, it’s not impossible. Other companies are also making changes. Post Foods is removing GMOs from Grape Nuts and is even having this verified by a third party. Ben & Jerry’s is going to remove GMOs from its products. The restaurant Chipotle is also making moves to begin the removal of GMO ingredients from its menu. Depending on the consumer reaction, we may see this trend continue. Posted on January 27th under Global Ecology.